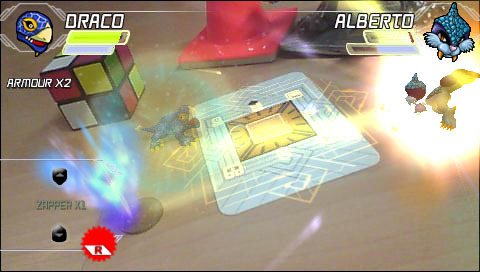 Invizimals is the latest augmented reality title to land on the PSP which is extremely reminiscent of the Pokemon franchise from Nintendo as players attempt to capture and collect these strange creatures. This is all done via the PlayStation Portable Camera which helps bridge the gap between the real world and that of the virtual world. Thanks to some clever cinematics, the player soon discovers that Invizimals exist in our world, however they can only be seen through the Shadow Zone that bridges these two worlds. The premise actually works, especially with the PSP camera and at times, it's almost like Ghost Busters as you use your PSP to find these creatures and needless to say, there are a considerable amount of them out there. 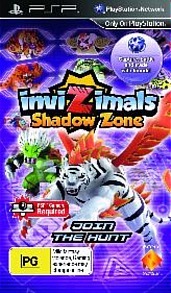 However as you collect these creatures, you also need to prevent Campbell from being unleashed onto our world and that is the primary goal of Invizimals: Shadow Zone. Campbell was actually thr first villain from the original game but even if you have never played the original (like me), you don't need any former back history at all. Thankfully. In terms of gameplay, it's quite simplistic, you speak to an NPC and they will give you a mission to complete and fortunately the game is populated with some interesting and colourful cutscenes to help progress the story along. One strange aspect of the game is that these cinemas use live actors that does make the game more realistic as opposed to cartoon or CGI cutscenes. 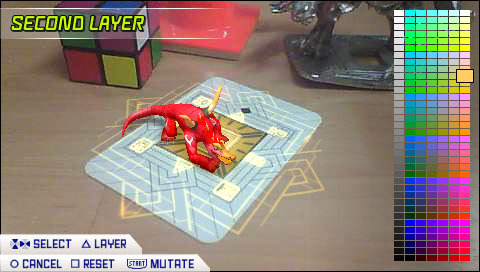 The PSP camera works like a treat as well and as you zoom around your room or desk, you will soon discover one of the Invizimals hiding in your world thanks to the inbuilt radar of your PSP. In order to catch the Invizimals, you need to use the trap card that comes with the game. Once the PSP detects the trap card, a mini-game then ensues (e.g. jigsaws, whistling or firing lasers) that requires you perform a variety of manoeuvres to catch these critters. Catching them is fun but combat is where the game shines and the game is a little bit of a button masher sometimes. Fortunately only with the mini-games and not that combat. The controls for combat are well mapped on the PSP and it kind of works as a turn based option with a set number of attacks like Fire or Earth. The easiest way to describe the combat is that it is like rock, paper scissors and learning the different attacks is the key part of the title. There is even an RPG element to the game as you can perform some basic customisation options on the Invizimals like appearance and statistics. 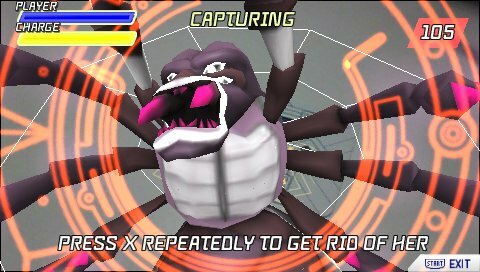 Graphically, the Invizimals is a good looking game on the PSP and the stars of the title are the Invizimals themselves that look detailed and interact well with their "real-world" environments. The combat animation is a joy to watch as are the various special attacks as all sorts of flying debris is thrown around. Add in some great cutscenes and this is one game that kids of all ages can play for a considerably amount of time. The music is quite upbeat, the voice acting a little forced and tacky but it actually works as do the great sound effects and different sounding Invizimals. In the end, Invizimals: Shadow Zone is a fun game that works on most levels as opposed to EyePet on the PSP which was a little lacklustre. 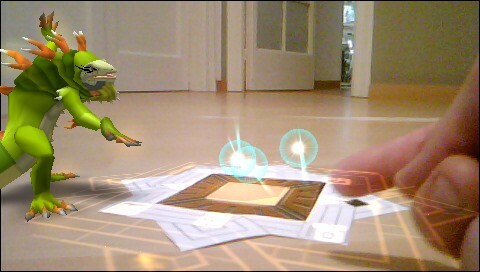 The augmented reality option works like a treat and for those younger gamers that enjoy collecting Pokemons or similar games, they will definitely enjoy this title from start to finish. Add in some multiplayer options and it's good to see another developer release something decent for this market. Great use of the PSP camera, nice graphics and a sturdy gameplay engine that works.